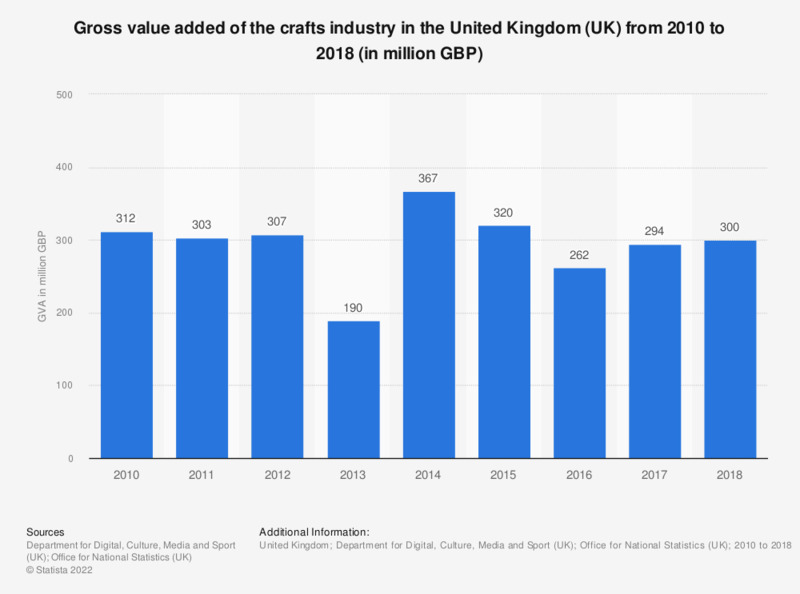 This statistic shows the gross value added (GVA) of the crafts industry in the United Kingdom (UK) from 2010 to 2017. In 2017, gross value added was 298 million British pounds. Gross value added was 265 million British pounds in 2010. 2017 GVA is based on the output measure of GVA to allow consistency with the sector measures for 2017. This is aligned to average GVA up to and including 2016 (last Supply Use balanced year) but then uses growth in the output measure as a proxy for GVA beyond that. The 2017 figure therefore differs from ABML (Gross Value Added at basic prices). 2010 – 2016 GVA estimates use balanced GVA at current prices (ABML).